Street names for prescription drugs are commonly used to obscure transfers that are illegal between users, distributors, or dealers. Although they are devised in an effort to defer law enforcement and others who would discourage their use, these names are easily recognized by the common abusers. 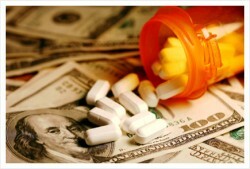 Many people use prescription drugs in ways other than the prescribed way. The most abused prescription drugs involve opioids, opioid derivatives, and synthetic opioids, CNS depressants such as barbiturates and benzodiazepines, and CNS stimulants such as amphetamines. Street names are commonly devised for easy recognition by appearance, type, brand, or expected effects. Some names are given to the various class or forms of the drugs and others are used within specific geographical areas or subcultures. The basic idea behind the names is to be inconspicuous and some names get changed, but, others have been around a long time. Opioids are the fastest growing epidemic in prescriptions drug abuse. Opiates are the naturally occurring alkaloids in the opium poppy plant including morphine and codeine from which many opioid prescriptions painkillers are derived. Opioids include hydrocodone and oxycodone along with their combination products such as Vicodin, Lortab, and Percocet.